9 audio compact discs; 11 hours, also available as a book. Have you ever been visited by a voice? I have, and the memory of that voice continues to bless me long after first hearing it in the audio version of Tony Hendra’s Father Joe, The Man Who Saved My Soul. 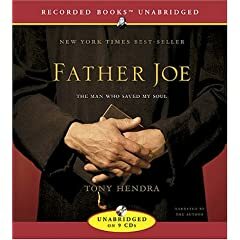 This work is a grateful remembrance a faith-filled Benedictine monk who providentially entered the author’s life as a spiritual director when Hendra was in danger of becoming a confused and illicit fourteen-year-old paramour. From the solid ground of his life in Quarr Abbey, a monastery nesting in the British Isle of Wight, Fr. Joe companions Hendra through a journey marked by deep spiritual rest and intense spiritual unrest. Hendra’s journey takes him from the halls of parochial school to Cambridge University, where he often performed with John Cleese and Graham Chapman (later of Monty Python fame). From there, he enters into a pantheon of satire and parody, becoming editor in chief of Spy Magazine, an original editor of National Lampoon, and playing the role of Ian Faith in the absurdly funny film This is Spinal Tap. As his forty-year relationship with Fr. Joe unfolds, we experience the wise and compassionate heart of a spiritual director who holds him as able: able to hear God’s love, able to receive God’s love, able to return God’s love, and able to be transformed through God’s love. But the journey is raw. This work is not for those in search of tepid waters. Rooted in the Christian faith tradition, the recounting of this journey looks at the human spirit in the rough, so rough that the avoidance of profanity, lust, and pride would have neutered the tale. This is a story for those who know, or want to know, that God meets us where we are, whether in our spiritually civilized worlds, our terrifying wildernesses, or anywhere in between. Had I simply read the book I would have missed so much. I would not have pictured fresh bread just brought out of the oven each time Fr. Joe affectionately refers to Hendra as “Tony, dear.” I would not have heard the hiss of false self, hiding just behind the veil of Hendra’s stunning wit. Even if the story were not true, the telling of it would bespeak truths pervasive in spiritual journeying and companioning. I would not attempt to describe the monk’s gifts in spiritual direction without you, the listener, first hearing him through Hendra’s virtual channeling of his hurried, eager, very English manner of speech, his r’s always threatening to become v’s. On paper that r and v relationship looks dull. In sound, it is a delicious prelude to a spiritual fugue, with excited stuttering bridging the two. Listen to Hendra’s vocal portrayal of Fr. Joe and prepare yourself to be delighted and nurtured by a human voice abundant with wisdom, warmth, love, and the potential for sudden mirth. Then, if you must, read the book. Janna Born Larsen, has a BA in Political Science from the University of Kansas, Lawrence, Kansas, USA, a JD from Washburn University School of Law, Topeka, Kansas, and a Master of Transforming Spirituality with a Concentration in Spiritual Direction from Seattle University, Seattle, Washington, USA. After years in legal and corporate worlds, she finally embraced ministry. She served in parish ministry for four years and is now completing her first unit of Clinical Pastoral Education. In the fall of 2005 she plans to enter chaplaincy residency in the Chicago, Illinois, USA, area.